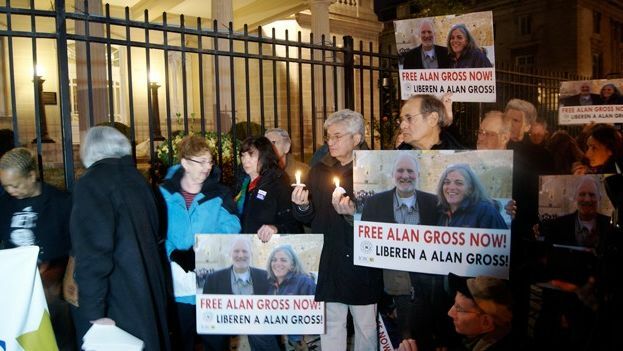 14ymedio, Yoani Sanchez, Havana, 17 December 2014 - With the pessimism that has now become chronic in our society, many Cubans thought that Alan Gross would only leave Cuba, "in a box," in an image allusive of a fatal outcome. The stubbornness shown by the Cuban government in its relations with the United States didn't presage a short-term solution for the contractor. This Wednesday, however, he has been exchanged for three Cuban spies imprisoned in the United States, bringing to a close a long and complicated political chapter for both parties. Gross was only useful alive and his health was rapidly deteriorating. And Raul Castro knew this very well. Hence, in recent months he raised the decibels around the proposed exchange for the agent Antonio Guerrero and the officials Ramón Labañino and Gerardo Hernández, all serving long sentences in the prisons of our neighbor to the north. To the extent that the 65-year-old contractor grew thin and lost his vision, official campaigns grew increasingly insistent about the exchange. When Gross threatened to kill himself, the alarms if the island's government went off and the negotiating schedule accelerated. Barack Obama, for his part, made clear that any change in policy toward Havana would come up against the insurmountable obstacle of an American imprisoned for "threats against the security of the State." Even the New York Times had suggested an exchange in one of its editorials on Cuba, and the publication of that text in such a prestigious newspaper was read as a preview of what would happen. As in every political game, we see only one part, while in the intricacies of power the threads of the agreement made public just today were being woven. For those of us who know the mechanism of pressure used by the Plaza of the Revolution toward its opponents, the capture of Gross itself was a move aimed at recovering the Interior Ministry's agents. The contractor wasn't arrested for what he did, but rather for what they could do with him. It was a simple hook and he was aware of this from the beginning. His crime was not in having brought satellite equipment to connect the Cuban Jewish community to the Internet, but rather in carrying in his pocket a passport that immediately converted him into a medium of exchange on the board of tense bilateral relations between Washington and Havana. In the game of politics, totalitarian regimes manage to win over democracies because the former control the public opinion inside their countries, determine all legal results to suit their purposes, and can continue to waste their nation's resources trying to free the moles they sent to their adversary's camp. Democracies, however, end up conceding because they must answer to their own people, they must live with an incisive press that criticizes them for making or not making certain decisions, and because they are forced to do everything possible bring their dead and alive back home.